Government of Pakistan, Ministry of Interior has announced 30 New Jobs in National Administration & Data Base Registration Authority Regional Head Office Lahore in Daily Express Newspaper 18-02-2018. Candidates who meet the required Criteria may apply for these NADRA Jobs 2018. These Jobs are for Mobile Registration Vans Project. 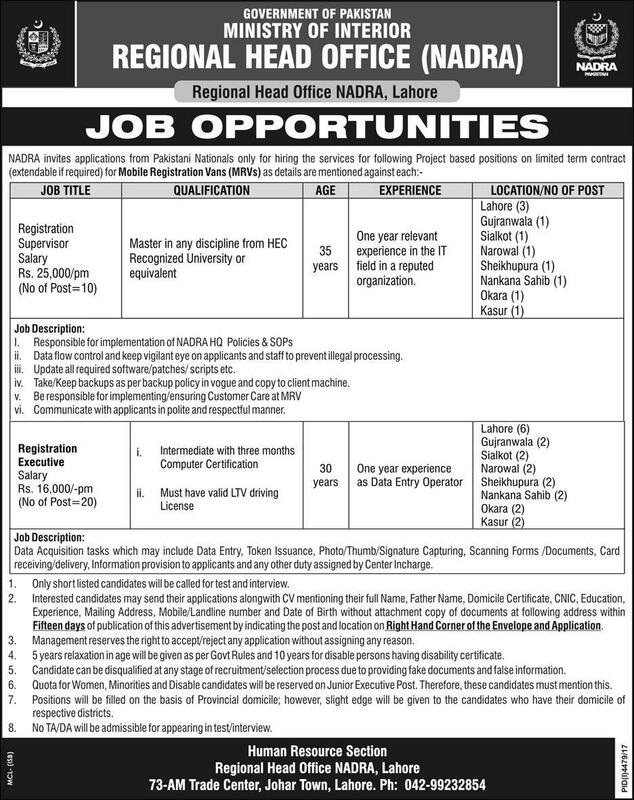 Candidates who wish to be job in NADRA can apply for Registration Supervisor & Registration Executive. Recruitment for these jobs are on Fix Pay Basis. Local Candidates will given preference. City Name Lahore, Gujranwala, Sialkot, Narowal, Sheikhupura, Nankana Sahib, Okara, Kasur.